How Much Urination Is Normal? How much urination is normal for a healthy adult cat? The Cat Expert offers an opinion. Question: How Much Urination is Normal? 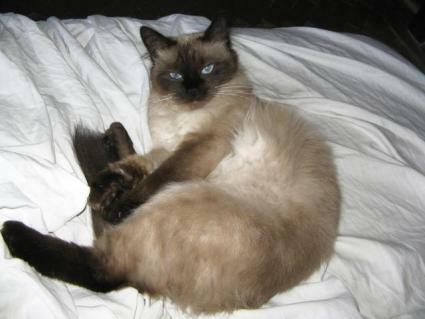 I have a purebred Siamese Cat that seems to urinate a lot in volume, not in frequency. He always uses the litter box and doesn't have a problem / pain urinating. However, the amount seems to be considerable, especially when compared to other cats that I have had or that belong to friends. Your male cat may just have a slightly larger bladder. It happens, especially in males. That said, let's take a look at what's considered "normal". The average ten pound cat is expected to take in approximately seven ounces of water each day. From this intake, you can expect a urine output of about six ounces. You can try tracking how much water your cat drinks in a day by giving him exactly seven ounces in his bowl in the morning and measuring how much is left at the end of the day. If the bowl is empty well before measuring time, measure out another four ounces and pour it in. You don't want to deny him a drink, just track how much he's taking in. If it turns out that your cat is drinking excessively, you will want to have your vet evaluate him for diabetes, since this is one of the most noticeable symptoms that accompany the disease. I hope you find my suggestions helpful, and hopefully your cat turns out to be completely healthy.